When the student gunmen opened fire at Columbine High School in 1999, the nation took a collective gasp. The very idea that schools could become a place of intentional yet random mass murder was unimaginable and so shocking as to defy belief. Today when students commit in-school murders, they’re met not so much with shock and disbelief as they are with a sense of tragic resignation. The headlines are regional or even local rather than national because on a national scale, school shootings are no longer front page, above-the-fold news. It is as if the world has become comfortably numb to the idea that childhood is a time of danger as much as of innocence. That sad fact makes Andrew Hinderaker’s Kingsville all the more forceful. 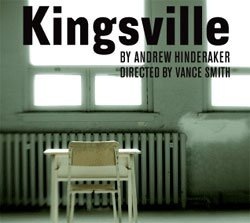 Delving the troubled world of a high school reeling from a student shooting, Kingsville is heart-breaking in its veracity and its sensitivity. In its world premiere at Stage Left, Kingsville is also powerful indelving the related topic of bullying; the sort of relentless, dehumanizing abuse that can drive young people to the violence borne of utter despair. Or at least it is for the first half or so of the play. For all its many merits, Kingsville loses much of its impact when its plot swerves away from its young protagonists and into the world of an adult who does something so far-fetched it’ll make your eyes roll in disbelief. We’re not going to give away the action here – that would be a major spoiler. Suffice to say, Hinderaker’s narrative ultimately sinks under the weight of its own preposterousness. Until then, Kingsville is a richly compelling story as it mines the volatile, triple-threatening world of adolescence, machismo and guns. Moreover, director Vance Smith has a remarkable pair of young men in the two key roles that anchor the piece. Andrew Raia plays Justin, a high schooler who has been the target of brutal locker room harassment. Nick DiLeonardi plays Justin’s best (perhaps only) friend Mike, a high school outcast who has found empowerment – and relief from all-consuming loneliness and self-loathing – by learning to shoot at a local teen center. Raia nails the rage, frustration and desperation of a young man for whose daily life is defined by humiliation and dread. It’s with stunning impact that Raia delivers a monologue describing the abuse – the details are excruciating, but it isn’t just the particulars that make the sene so harrowing. Raia taps into an anguish that’s almost unbearably raw and authentic. DiLeonardi’s Mike seems – superficially at least – more laid back than the deeply wounded Justin, but he’s just as heart-breaking: A fundamentally decent kid driven to do something terrible simply because he doesn’t have the tools to cope with with all the badness around him. The adults in Kingsville aren’t as effective, primarily because the characters feel more like representations of opposing points of view more than actual people. Wayne (John Arthur Lewis), reeling from the death of his son in a school shooting, advocates arming students so that they aren’t sitting ducks if a gunman opens fire on a classroom. Justin’s father James (John Ferrick) passionately opposes Wayne, a stance that has been an excuse for Justin’s tormentors to take their bullying to heinous levels of cruelty. Hinderaker also has Audrey, a lecturer (Cat Dean) punctuate the piece, relaying the results of a startling and revealing study about contemporary attitudes about machismo. Audrey’s direct address, like that dubious plot development, detracts from Kingsville more than it adds to the production. The speeches are didactic, and while they offer some eye-opening information, they put a hitch in the storytelling. When the action stops so that Audrey can break in with academic commentary on kids and guns, the audience is bumped out of the story and into a virtual lecture hall. What Kingsville does well is show how integrated the poisonous threads of macho man culture are within the tapestry of gun culture. They provide the basis of a fantastic, if ultimately unbelievable, story.